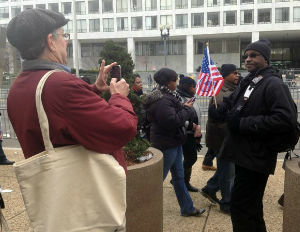 Museum curators were on a mission as the 57th Inauguration came to a close Monday afternoon (January 21). Since 2008, curators have been searching for pieces of history to commemorate President Obama for a display in the soon-to-be-opened Smithsonian National Museum of African American History and Culture. The museum will display a slew of messages, documents, photographs and other significant memorabilia that will help honor the first black president. Museum curator William Pretzer was one of the few individuals in search of memorable objects. Not finding much beyond the mass production of store-made items, Pretzer came across a few good men who had a real story to tell with their clothing or memorabilia. As explained by the Associated Press, the first was “Ollie Parham and her fellow travelers,â€ who “stood out in their bright yellow Alabama NAACP sweatshirts.â€ The group traveled 19 hours on a bus from Huntsville, AL to attend Obama’s second inauguration. The curator asked her about donating any objects they may have for the museum, but Parham said she will have to get back to him. Later that day, Pretzer came across a woman named Peggy Shamley Christian who was eager to find something to donate for the display. After going through her purse, the retired schoolteacher found an Obama magnet and happily handed it over for the cause. Pretzer stumbled across several more personalized or handmade commemorative items including a man with two life-sized cutouts of President and Michelle Obama. Set to open its doors in 2015, the Smithsonian Museum of African American History and Culture currently sits with “more than 300 Obama-related items, including furniture from a 2008 campaign office in northern Virginia and a cloth banner from Tanzania with an Obama portrait and message reading ‘Congratulations Barack Obama’.â€ In addition to the presidential display, the museum will showcase a timeline of African Americans on a floor that will go from 16th century slavery, Reconstruction and the Civil War. The timeline will end with President Obama’s first election (2008).